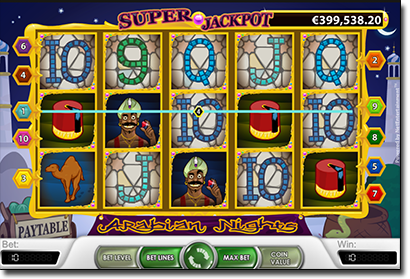 Arabian Nights is one of Net Entertainment’s popular progressive jackpot video slot games – a classic and simple five reel, three row slot that successfully captures an exotic Middle Eastern ambiance, with background Arabian music and sounds, and heavily inspired by fictional stories like Ali Baba and the Forty Thieves and Aladdin. Below we outline all of the important gaming info for the Arabian Nights online and mobile slot game. The game also boasts an auto-play feature that players can set to automatically play anywhere from 15 to 1000 spins. Players can also make the most of the advanced auto-play settings and set a desired time to ‘stop’ on the auto spins, such as: on any win; if free spins are won; if the progressive jackpot is won; if a single win exceeds a set amount; or if the player’s total cash amount increases or decreases by a set amount. All wins pay from left to right (except scatter symbol wins) and only the highest wins are paid per line. To check out all the payouts for every symbol, you can open the game at Rizk Casino and click on the pay table option. The active pay lines are also displayed in the pay table feature. The wild symbol in Arabian Nights is the Arabian prince (holding a gem). It substitutes for all symbols (except the scatter feature) to create winning combinations and will act as a multiplier, too (doubles all wins). The progressive jackpot: Land five Arabian prince icons on an active pay line and you will secure the Arabian Nights progressive jackpot (known as the Super Jackpot). You must play the betting maximum of $5 (covering all pay lines) to have a chance at winning the massive progressive jackpot reward. Without all 10 pay lines active, if you land five Arabian price icons, you will win 10,000 coins (equivalent to $5,000). The jackpot has been calculated to pay out an average win of approximately $1,200,000 every 135 days. The largest Super Jackpot payout in the game’s history was €4,800,000 (roughly $6,900,000 AUD). It resets at $100,000 each time it is hit, and continues to increase from that start point until it is won again. The scatter symbol is the magic lamp. Land three of more magic lamps anywhere across the reels and you will trigger 15 free spins, where all your wins will be multiplied by three (excluding a jackpot win). More free spins can be re-triggered within the free spins round. Australians aged 18 years and older can legally play the Net Entertainment Arabian Nights online progressive jackpot game at Rizk Casino, along with more than 400 other immersive online slots games from multiple different gaming software developers. G’day Casino is on of top-rated online and mobile casino sites, offering an unlimited new player matched deposit cash bonus and a free slab of VB. It has recently undergone a complete site transformation, and its user friendly design, neat layout and quality real money random number generated (RNG) and live dealer casino games, is gaming entertainment not to be missed. Net Entertainment is known for their graphically advanced and feature-bonus filled video slots, but Arabian Nights is a nice contrast from all that jazz. The simplicity of this title allows for no distractions and the background soundtrack offers a nice calming environment. The progressive jackpot is one of the larger ones on the Internet, and it can be won with the right icons lining up across any active pay line, so this adds considerably to the excitement.